House Speaker Tim Moore announced filing of H1092, a bill that would add voter ID requirements to the NC Constitution if voters approve it on their ballots in November. Voters would not know the specifics of photo ID requirements, like if student or military IDs count, prior to voting. If the measure is approved by voters, lawmakers would then be allowed to decide what specific types of ID the state would accept at the polls. This move comes after Republicans’ 2013 “monster” voter ID bill was struck down by the courts for “targeting African-Americans with almost surgical precision.” ACLU and Democracy NC have already come out against this revival of voter ID which they say amounts to voter suppression. Democracy NC issued a report on the 2016 election based on first-person accounts gathered during early voting and Election Day 2016 from voters, on-site poll monitors, and calls to the Election Protection hotline. The data “demonstrate that much more granular problems disrupt the rights of voters to participate in elections — problems that state and county elections agencies have the power and responsibility to address," according to Democracy NC. The report highlights issues from the 2016 election including inconsistent implementation of out-of-precinct voting, excessively long lines, voting equipment breakdowns, and poorly trained poll workers. Based on the 2016 voter experience, Democracy NC suggests some changes the state and county boards of elections can implemnet for 2018. Hear what North Carolinians had to say on new maps proposed by House and Senate Republicans. 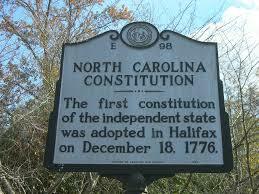 In Halifax County the public hearing took place in one of the districts ruled an unconstitutional racial gerrymander.